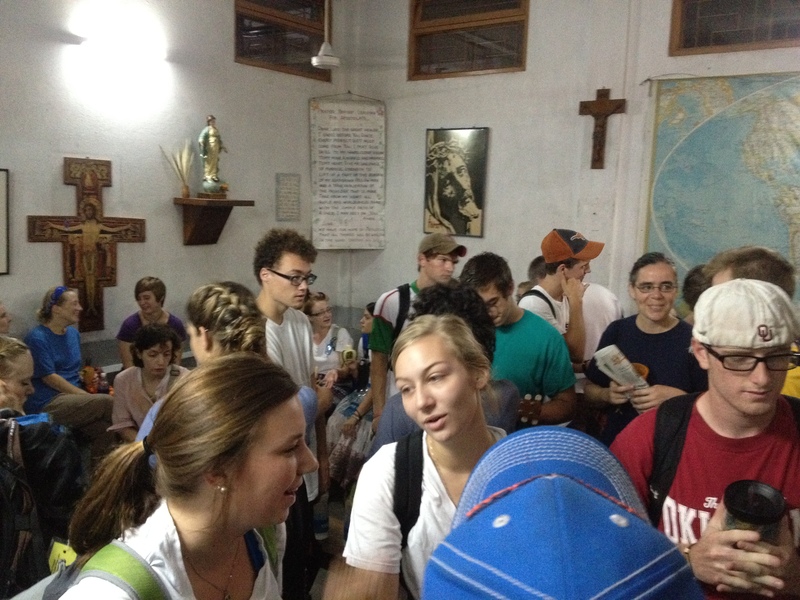 Yesterday was our final day of service at Mother Teresa’s homes. In just a few hours, we will begin the long journey back to Texas. Our students have experienced so much as they have compassionately served the least of these at Prem Dan and Shanti Dan. Among the lessons they have learned is the importance of closing the distance that separates us from those who are hurting and in great pain. They have learned that being the hands and feet of Jesus ultimately means drawing near to others, taking a personal interest in them, noticing the color of their eyes, and serving them without expecting anything in return. They have learned how fragile life can be and how much joy a smile and a touch can bring to those who have lived a lifetime in the shadows and filth of Kolkata’s streets. They have also learned that one person who is willing to serve others can make a difference. The Italian volunteers were my favorites. I looked forward to doing laundry with them each morning. They lifted our spirits by singing at the top of their lungs. Mother Teresa said, “I very often tell the Sisters to approach the poor with joy, knowing that they have plenty of reasons to be sad. They don’t need us to confirm their sadness for them.” The Italian volunteers filled the air with joy. My Italian friend still radiated the joy that had so impressed me in 2009. I was so happy to know that he had returned to serve. This time, we exchanged contact information. After all of the volunteers left for their respective assignments, I stayed behind to chat with Sister Margaret and Sister Mercy Marie. Because I was scheduled to speak at International Justice Mission later in the morning, I was unable to return to Prem Dan yesterday and was therefore able to stay a little longer at Mother’s House. These two Missionaries of Charity who have become good friends thanked me for returning to serve with our students. They also gave me a tiny piece of one of Mother Teresa’s saris as a token of their appreciation — a gesture of kindness that I will always remember. Mother Teresa was not a complicated person. She just fell in love with Jesus and gave her life without reservation to serve Him. And, by so doing, she unwittingly captured the attention of the world. I think that Mother Teresa’s ABCs (something that the Missionaries of Charity distribute to volunteers) sums up much of what made her such a beautiful person. Each of us should certainly make it our aim to learn Mother Teresa’s ABCs. Always have the courage to say sorry. Every minute is precious — don’t waste your time. Find out what is nice in each other. Have deep respect for each other. If you really want to love God, love one another. Just do small things with great love. Learn to pray, love to pray, and pray often. Make time for each other in your family. Only believe — you are precious to God. Put love in whatever you do. Quite a lot of people have forgotten what love is, so begin to give the joy of loving. Take the trouble to listen. Use your talents for the glory of God. Very often, we look but we don’t see. Let us look and see. When humiliation comes, accept it and offer it. Zeal is a second name for love. Do not lose that zeal! Omar, Thank You for serving the people of Kolkata, and thank you for giving these young adults the opportunity to share this amazing journey. I have anxiously awaited daily updates. Thank you for showing us back in Texas the wonderful work that God is doing thru Mission work at Mother Teresa. Have a safe flight back to Texas. Thank you for following our journey, Sharon. We are currently at the airport in Kolkata awaiting our flight to Dubai. Lots of good conversations going on about our experiences. God has done good things in and through our students. Thanks Omar! I love the ABC’s! What an honor that the Sister’s gave you a peice of Mother Teresa’s sari. I love what the Lord as been doing in all the KBC kids around the world. May His name be glorified above all! Amen, Sterling. Proud of our students and how they have glorified God around the globe. Found your blog through your Bible Teaching Notes web site. I so needed to read the ABC’s today! I am currently down and it is a great reminder to help me move on in love than retaliate in anger. Thank you. Thanks for your comment. So glad to know of the timing of this post for you. Blessings to you as you continue your journey. Omar, I cannot thank you enough for chronicling your trip to India with our beloved 2012 seniors and their beautifully selfless chaperones. As a mama, it has been so difficult knowing that Devon was about as far away from home as logistically possible. Your blog was such a blessing. What happened in Kolkata shouldn’t stay in Kolkata 🙂 Can’t wait to see you all tomorrow. Thanks for your kind words, Kim. Leaving Kolkata was bittersweet. We are currently at our gate in Dubai and will board our flight to Houston in a few minutes. We will see you all soon.